A bill that aimed to clamp down on corruption in Congress and on Wall Street was rejected on Tuesday, raising the ire of Iowa Senator Chuck Grassley. The bill would have kept members of Congress from making investments based on “insider trading” information they gained from being lawmakers. 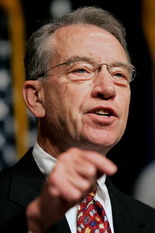 Grassley, a Republican, had offered an amendment that would have forced all so-called “political intelligence officers” to register as lobbyists. Grassley says the proposal was killed by Senate Majority Leader Harry Reid, a Democrat, in favor of a much-weaker House version. The Grassley amendment would have required registration and public reporting by anyone who deals with inside information that came from Congress. Another section would have toughened laws and penalties in public corruption cases. Grassley says Reid used a procedural move and abandoned the Senate’s stronger bill and went with the watered-down House version instead. The legislation is known as the STOCK Act, for Stop Trading On Congressional Knowledge. President Obama had said earlier that he’d sign it.